Yesterday was fourth Sunday sketching with our drawing group Urban Sketchers Montreal. With the fall chill in the air, we returned to the Redpath Museum. 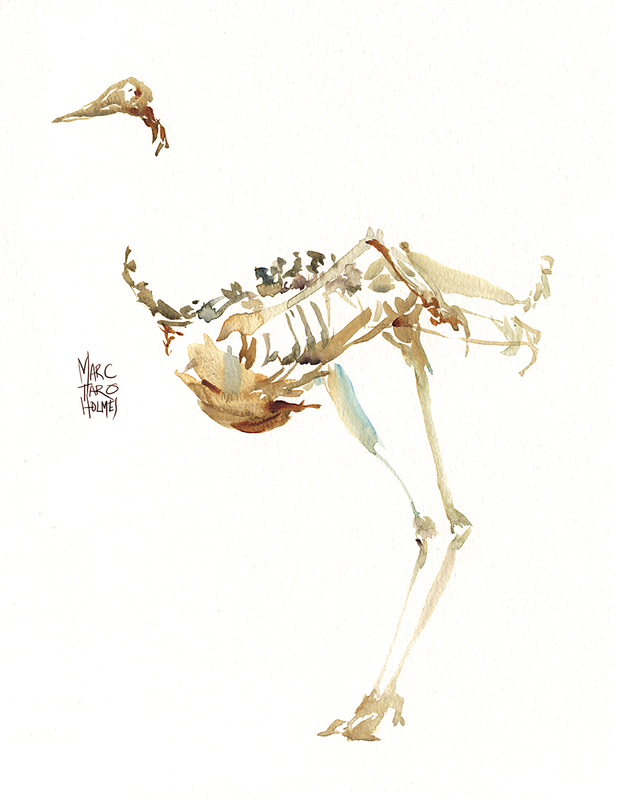 Blog readers will know, I love a chance to draw from taxidermy animals and mounted skeletons. So this was just a relaxing day for me. Here we have a cormorant, puffin and egret, along with a common farmyard chicken skeleton. 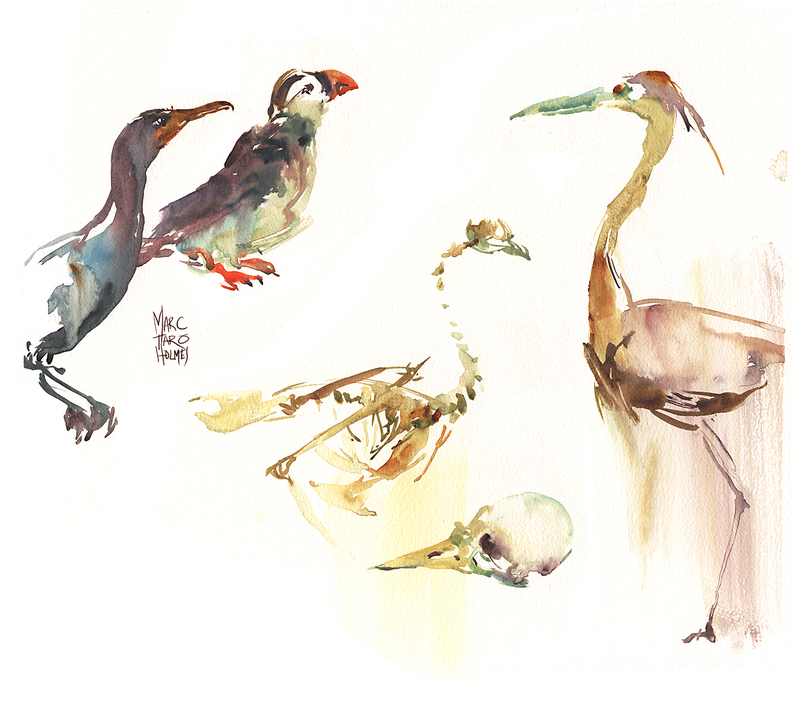 I didn’t note what kind of bird skull that was – it was only a couple inches – the drawing is bigger than the real thing. The key to these water-sketches is making the silhouette in a single wet shape – so the colored strokes fuse. But also knowing when to simplify. I haven’t counted every rib and vertebra on this ostrich skeleton. It’s just the impression of the animal – not really a scientific record. One day I’d like to try for that – a perfect rendering – but that’s not the spirit of an urban sketchers meet up, chatting with friends and sketching for enjoyment. With these ‘casual’ sketches, I sometimes take a few tries at it. So they look easier than they sometimes are. This is the second of two ostriches I did that day. My first try is sometimes a bit off – a bit out of proportion or tentative in the brushwork. So I’ll just do it again while it’s fresh in my mind. It always gets a little better the second or third time. The thing I love about the Redpath is the Cabinet of Curiosity feeling of the place. Where else will you see dinosaur bones, Samurai armor, Egyptian mummies, sea shells, taxidermy animals, African musical instruments – all this in one small exhibition hall. It feels more like visiting a crazy uncle’s mansion than going to a museum. We skip December, due to the holidays, but I hope to see some of you at next year’s Fourth Sunday Sketching. 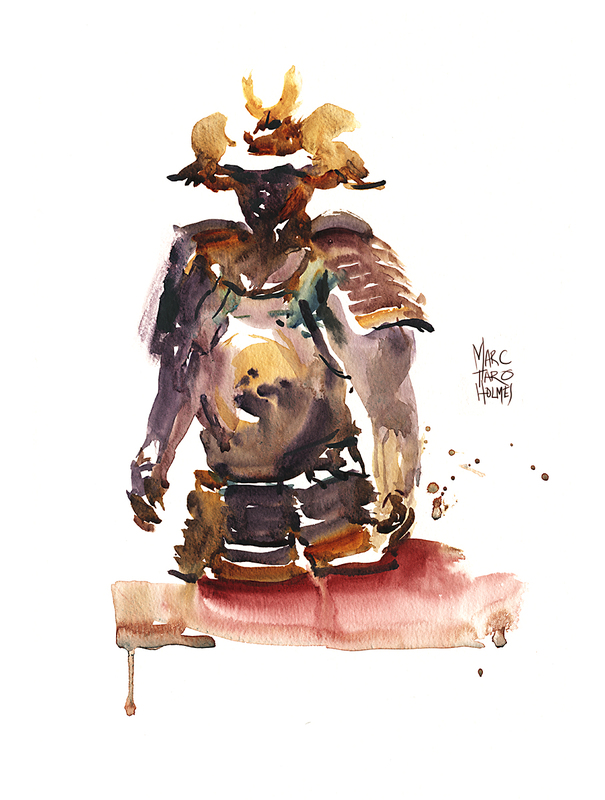 Just watch the USK : MTL blog for the location announcement. ← So – I’m working on a book. But not the kind you’d expect. Marc, Love these seemingly effortless sketches. We all know they’re not, but that they come from a very well oiled place in you. Thanks very much for sharing. Simplicity gives more expression to the animals positioning rather than being caught up with every detail. Lovely sketches. We made it to Redpath Museum on our trip back in April – great place esp for the kiddies.. great sketches!